AP Postal MTS Admit Card 2019: AP Postal department is going to conduct the AP Postal MTS Exam on 28th April, 2019. 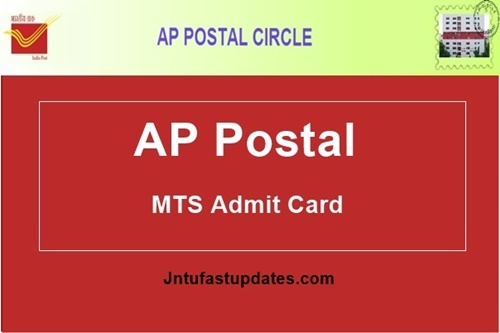 Applicants those who have applied for AP Postal Circle MTS written test 2019, must download AP Postal circle MTS hall ticket/ AP Postal MTS Admit Card to proceed with the examination. Candidates can get their admit cards/ call letters from the AP Postal circle official website, appost.in. aspirants must preserve the admit cards safe and carry the admit cards while going to the examination hall. Candidates can check more useful guidelines of AP MTS examination from this article. Andhra Pradesh Postal Circle has advertised Multitasking Staff posts in the month of February. The vacancies include Administrative Offices, Sub Ordinate Offices – Postal Divisions, Sub Ordinate Offices – RMS Divisions. The AP Postal Circle has advertised 33 Sub Ordinate Officers and 13 Administrative Officer posts. Many of the hopefuls seeking to get postal circle jobs have applied from February to 8th march for the multitasking staff vacancies. The AP Postal circle is expected to conduct the MTS written test shortly. Applicants are advised to download AP Post MTS hall tickets 2019 from the AP Post official website, appost.in. the admit cards will be released before 10 days of the examination (tentatively). All the candidates applied for the MTS jobs can keep checking the AP Post official website to download the hall ticket. Candidates can find the examination venue, date and time of examination, and other details from their admit cards. Candidate’s name, register number, father’s name, signature, photo etc details will be printed on admit cards. Once go through all the details and report to the authority in case of any misprints in any of the columns. Hopefuls have also instructed that they must carry any of the valid identity proof along with the admit cards. Do not forget to carry both admit card and id proof while going to the examination. Check more instructions from the AP Postal Circle MTS admit card. Just by following the step by step process the candidates can download the hall tickets. Keep it in a safe place to carry it to the examination centre. how to download ap post MTS hall ticket? which things are to take for examination hall? when hal ticket will release? Release the exam date of AP MTS…….